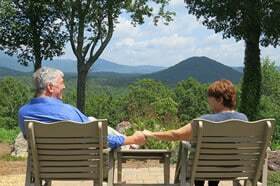 Lucille’s Mountain Top Inn & Spa was founded by Lucille Hlavenka and her husband George in 2001. 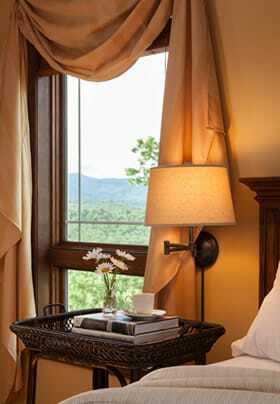 After deciding to open a small inn, the Hlavenkas searched in a wide area for the perfect spot to build and ultimately found a small mountain top just off the historic Unicoi Turnpike, overlooking the pristine Blue Ridge Mountains and scenic Sautee Valley. The inn was designed by Mr. Hlavenka, a commercial architect, who laid out the guest rooms and common areas to take advantage of the outstanding views and to provide guests with the comforts and conveniences found only in the finest lodging accommodations. In 2006 a full-service day spa was built adjacent to the inn to offer both guests and local visitors, spa services in a relaxing, pristine environment. Connected to the inn by a covered breezeway, the Spa is decorated in soothing green and gold tones, reflecting the colors of the surrounding mountains just outside. In 2014 a remodeling project added a new guest suite to the Spa building that is the most luxurious and largest of our guest accommodations. In 2011 Lucille retired and handed over the reins to Jim Matthews and Jerry Morris, who maintained Lucille’s name in honor of the Inn and Spa’s founder. Competently assisted by the inn’s mascot and official greeter, Gracie the Miniature Schnauzer and a team of professional innkeepers; they added their own influence to the inn and spa by focusing on exceptional service, outstanding food & wine, and facility upgrades. Their goal was for every guest of Lucille’s to have the best small inn experience of their lives…and judging by the huge increase in popularity of the Inn and Spa, they succeeded! At the end of July, 2015, Charlie Anderson and her husband Chuck came in to pick up where Jim and Jerry left off. Thus far they have renovated most of the rooms in the main building, opened the new Garden Suite, and added the Apartment…with more tweaks and improvements in the works. Our goal is “invite every guest to experience the restoration of a peaceful and relaxing retreat,” so they can have the best small Inn experience of their life, bar none. We look forward to showing you “where restoration meets the mountains” in North Georgia. I can’t tell you how special my stay was with you. Everything was exactly what I needed and wanted. Every morning was such a treat – french toast, muffins, perfectly cooked eggs. The energy there was so peaceful and loving. I can’t wait to come back. Thank you for all you did for me while I was with you! You made my trip so special.